Angry Asian Buddhist: Project Renew: Rebuild the Lao Temple! Project Renew: Rebuild the Lao Temple! Remember the Lao Buddhist Temple of Colorado that burned down? Well, now you can help. Especially if you live in Colorado. 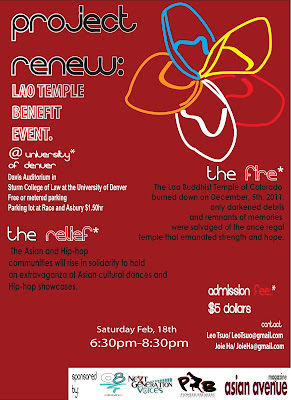 On Saturday, February 18, 2012, you can attend a fundraiser at the University of Denver where “Asian and hip-hop communities will rise in solidarity to hold an extravaganza of Asian cultural dances and hip-hop showcases.” Admission is just $5! The Lao Buddhist Temple of Colorado burned down on December 5, 2011. Only darkened debris and remnants of memories were salvaged of the once regal temple that emanated strength and hope. Even a small donation will make a big difference to this community. You can learn more about the temple at their website, where you can even submit a donation by Paypal. Planning on attending the fundraiser? Let me know—I’d be delighted to post your photos or share your thoughts on this blog.